As you may be aware there have been a number of concerns raised about the lack of parking enforcement in Rother district. The enforcement of on-street parking restrictions across Rother is currently the responsibility of Sussex Police as a criminal matter under the Road Traffic Act. The top priority for Sussex Police is the prevention and detection of crime. They cannot give parking enforcement the level of attention that the public might expect and state they will only take action on parking issues where there is a safety concern. We have worked with Rother District Council (RDC) to look at how parking enforcement can be improved. As a result of this we will be applying for permission to the Department for Transport to introduce civil parking enforcement (CPE) across Rother district. This is a lengthy process and we do not anticipate CPE being introduced until 2020. Under government legislation, all council operated parking schemes must be self-financing. This means income from council tax and business rates cannot be used to fund the operation and enforcement of our parking schemes across the county. To comply with legislation we need to set parking charges that will make sure we cover the operational costs and will pay back the initial set up costs of introducing the scheme. Parking income will primarily come from the cost of permits and pay and display parking charges. a number of minor changes to existing parking restrictions and formalising existing school “keep clear” markings. We will be writing writing to residents, businesses and other stakeholders to provide information about the proposals in your area and to invite comments on the proposed changes. The accompanying map shows an overview of the proposed changes to the existing parking restrictions and proposals for additional restrictions. Please visit our website, from Monday, November 19 onward, where there will be more information and please take the time to complete the online questionnaire. Alternatively you can visit Bexhill, Battle or Rye library to complete the questionnaire online via a public access computer or to pick up a paper copy. We will also be holding public exhibitions where you are invited to come and view the proposals and discuss these with us. In Rye these will be at the Town Hall, Market Street on Friday, November 30 and Saturday, December 1 from 9am to midday and 2pm to 8pm. The level of support will determine the outcome of this initial consultation and we would urge you to look at the proposals and submit your comments. All comments received during this round of consultation will be analysed and help determine the final scheme proposals. Comments can be made via the website at the above link. The consultation opens on Monday, November 19 and closes on Monday, January 14. We will only be able to consider comments received by the closing date. If the proposals are taken forward, we will draft the supporting traffic regulation orders (TRO) and these will be advertised allowing 21 days for the formal consultation period. 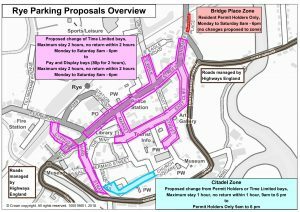 If we do not receive any objections the parking restrictions will be introduced as advertised and the TRO will come into effect 14 days following the end of the formal consultation period. Any objections received during the formal consultation period will be reported to the planning committee for a final decision on whether or not to implement the proposals. Image Credits: Gerard Reilly, ESCC. 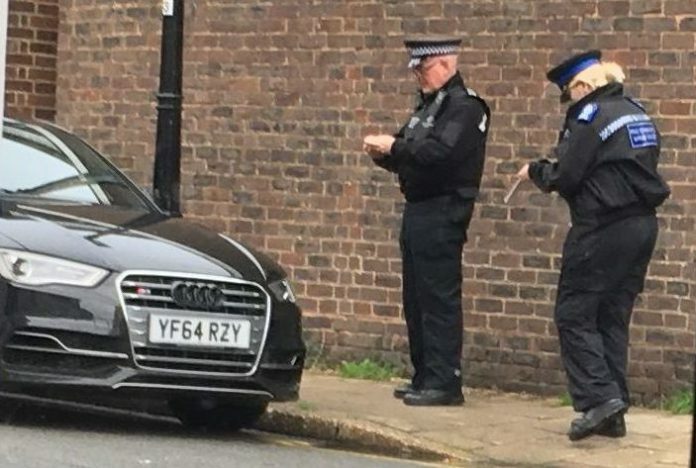 Amazing, two officers for an incorrectly parked car, yet when one is burgled or vandalised there is not enough manpower to send anyone to register or investigate matters??? I still believe a park and ride scheme using Gibbets Marsh car park as the parking base for out of town cars would provide a better town for pedestrians both local and out of towners. How typical. !2020 to implicate.–what a joke .! Another example of how ridiculous Gov. rules/red tape are. You will probably find that Brexit T&C’s,will not allow it at all.!! High time common sence prevailed, turn the middle salts into a car park, with a park and ride to the citadel. No cars between 9 am untill 5pm. In this new proposal, as usual, no provision has been made for the majority of the residents of the town. Only a tiny portion of the Citadel – Watchbell Street – has been earmarked for permit holders. This will benefit a handful of homeowners, ignoring all the other residents of the town who, just as before, will have no entitlement whatsoever to park within a reasonable distance of their homes at a sensible price. The cheapest parking in the town is now £2 per day. While this is a perfectly reasonable rate for visitors to the town, it is quite absurd to expect residents to pay over £700 a year to park in uncovered, unprotected car parks several hundred yards from their homes. Furthermore, the largest and least inconvenient of these car parks, the old cattle market, is unavailable for at least 50 days each year when the market is in progress. –	Leave their cars in Military Road, on the outskirts of the town, the only road where there are no parking restrictions. The effects of this can already be seen every Thursday, when Military Road becomes clogged with cars, many of them dangerously parked, causing a hazard to other road users, and denying the residents of that street the possibility of parking near their homes. Once CPE comes into force, this will become an everyday problem, as residents of the town will be forced to park there to avoid fines and excessive charges. The whole parking issue will simply be shifted to a new location! 2)	As a business, there will be a better chance of being able to park near to your place of work. Both of these admirable aims would indeed benefit my household and others like ours in Rye, but CPE will make them impossible to achieve – in fact, residents will be much worse off than before. In my view, Rye needs to follow London’s example. I previously lived in Battersea, where the problems of parking are much worse than those of Rye. There, residents currently pay £146 a year for a parking permit. This does not entitle them to a parking space but, if they can find a space, they are allowed to park there for as long as required. Other districts have similar permit arrangements, sensibly priced, e.g. Twickenham £109; Ealing £83; Hounslow £80 (remember, these are London prices!) These tried and tested systems combine practicality with a reasonable tariff for parking in areas where there is simply not enough space for everyone who would like to park! In my view there are several issues. – there should be more short term loading bays in the High St to cover East and West as well as Centre ( by the George). – residents’ parking has not really been addressed. A new universal system (as found in other towns/cities) should be included in the proposals rather than preserving an exclusive system which allows a small number of (cheap) permits for selected residents and hotel guests by illogical postcode lottery in one or two areas. – there is no provision for Blue Badges, which will mean that, despite enforcement, the vehicles of the disabled will continue to litter the double yellow restricted areas. I hope that others will raise these during the consultation.